While shopping at the Korean grocery store (that’s H-Mart for my peeps in the know) yesterday, I saw a sign marked “purple yams” atop what appeared to be innocuous white-skinned sweet potatoes. Naturally, I had to buy some, even though I had no idea how I was going to prepare them. Once home, I did a bit of research and discovered that they are not purple yams, which have a dark purple skin, but are in fact purple Okinawan sweet potatoes. They have an earthier smell than common sweet potatoes and are less sweet. I had to think a bit on how to prepare them and dismissed the most traditional ways (baked, mashed or in pie) since all of those methods just scream autumn and winter. I settled on gnocchi since pasta is always in season. 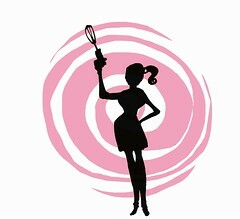 Now I have been cooking for my husband for over 10 years and he obviously has been very-well fed during that time. He doesn’t give out praise lightly and most of the time it seems he’s a bit too blasé for my liking about my culinary offerings. I am happy to say he absolutely raved about this meal. The subtle, earthy sweetness in the potato meets the cardamom and mace as equals, with neither spice nor sweetness claiming dominance. The texture is lighter than regular gnocchi due to the ricotta and the dusting of freshly grated parmesan cheese immediately before serving elevates this dish into something unforgettable. Place sweet potatoes in large microwave-proof bowl. Cover with plastic wrap, making a slit to allow steam to escape. Microwave on high until tender, about 10-12 minutes. Cut in half and cool. Scrape soft sweet potato flesh into medium bowl and mash or put through potato ricer. (I do not have a ricer, so I zapped it in the food processor for a few minutes to get all the chunks out). Add ricotta cheese; blend well. Add Parmesan cheese, brown sugar, salt, 1 teaspoon of cardamom and mace; mash to blend. Mix in flour, about 1/2 cup at a time, until soft dough forms. Turn dough out onto floured surface; divide into 6 equal pieces. Rolling between palms and floured work surface, form each piece into 20-inch-long rope (about 3/4 inch in diameter), sprinkling with flour as needed if sticky. Cut each rope into 3/4 inch pieces. 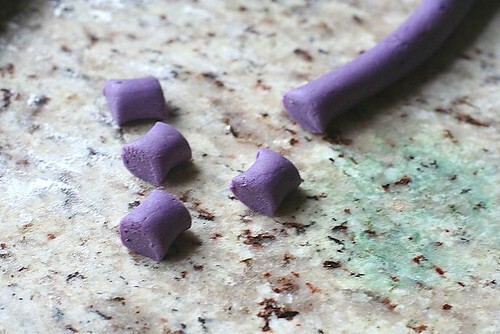 Edible purple playdough. Without that weird smell. Using thumb, roll each piece over tines of fork to indent, making a “C” shape. Transfer to baking sheet. 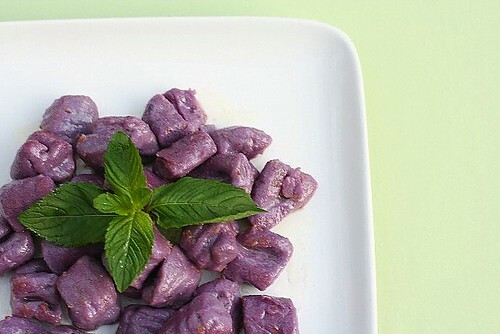 Gnocchi is a great way to get your kids to help in the kitchen. 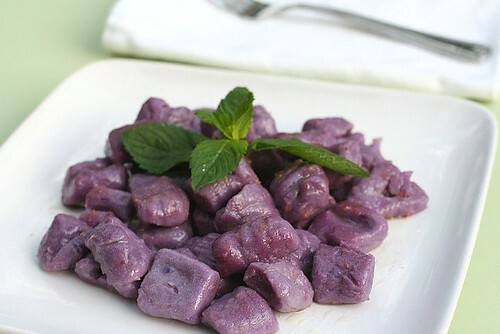 Purple gnocchi turns more reddish-purple after cooking. Melt butter in heavy large saucepan over medium-high heat. Cook until butter is brown and have toasty aroma, swirling pan occasionally, about 5 minutes. Add ½ tsp. cardamom and mix well. Season butter with freshly ground pepper. Add gnocchi and sauté until gnocchi heated through, about 6 minutes. Serve with grated parmesan cheese and be prepared to be wowed. My goodness, the COLOUR! Absolutely delightful. I really hope I can find purple sweet potatoes at my local grocer. What an amazing colour! Normally I go with a sage butter with gnocchi but I like the sound of the cardamom butter. 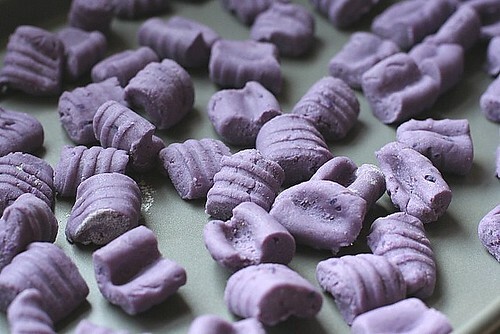 this is amazing, such an attractive colour, purple, so stricking, such an envy to see, I wish to eat it straight away. wow, you are real creative babe! 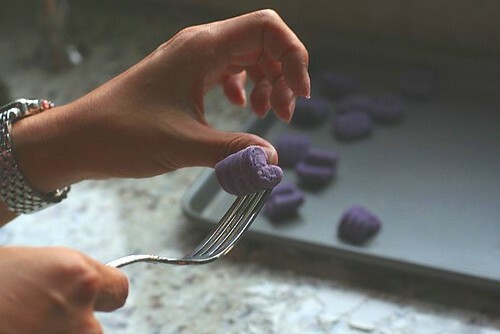 I love purple yam….I’m dying to try thisss! I don’t know if these are my thing, but I really like how you try a wide variety of dishes to post about. It makes your blog really interesting to read—you have a nice balance. Wow, I have never seen this before and this is so interesting! Oh dude! Those are absolutely AMAZING! 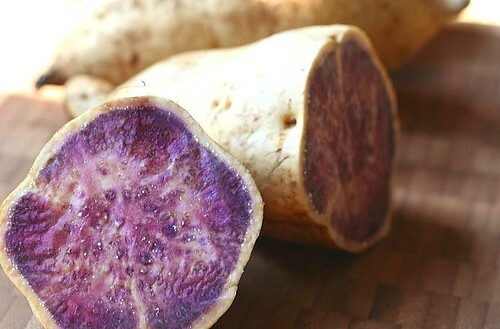 We can get red sweet potatoes here in Japan, but I have not seen purple. I will have a look around the internet. Wow, what a good idea. I have used them to make japanese style potato salad; but if I find them again I will try this. Wow! 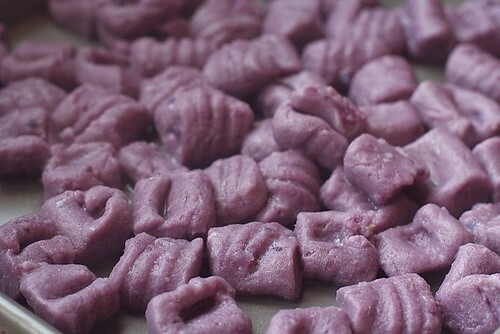 Now that’s purple with a capital “P.” Purple is my favorite color but I’m a little frightened by it in food form. I bet kids would get a huge kick out of being served this for dinner though. Very imaginative! Thanks for the great post. Beautiful results, and sounds delectable, too. Thanks so much for sharing! Yay! 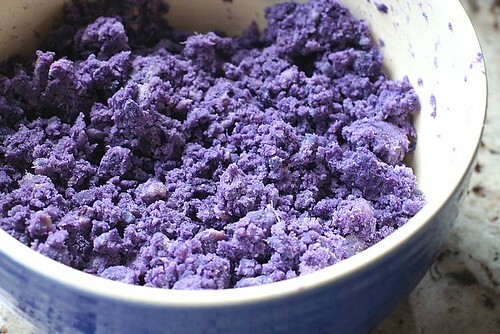 Now I know what to do with those purple potatoes and yams I’ve been growing! Great post! I love the colour! We have been gleaning the Okinawan Sweet Potato Fields in Hawaii and I was looking for more ideas of what to do with them… and came upon your delightful blog. I would love to subscribe… but did not see a link. Best to you in all you are doing.